Does this Dutch VPN have the worst free account in the world? The Windows client gives you much more functionality than we expected, but otherwise proXPN's service is underpowered and overpriced. 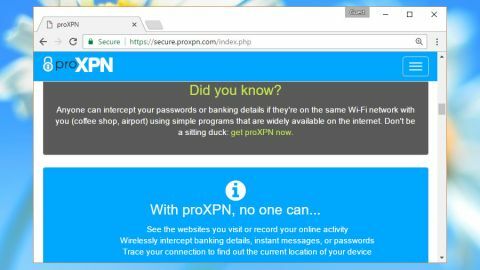 Free VPN plans are usually a convenient way to try a service before you buy, but proXPN's offering is a rare exception, so restricted and stripped down that it's almost entirely useless. We moved quickly on to the Premium account. This dropped all the restrictions, and gave us 12 locations spread around the world (Europe, US, Canada, Hong Kong, Australia, Singapore). Not amazing, but far from the worst we've seen. One possible issue is that there are clients for Windows and Mac only. ProXPN has very basic instructions to set up the VPN on Android and iOS devices, but despite being VPN-compatible we couldn't see anything about setting up the service on routers, or other devices. Maybe the value would win us over? Nope. ProXPN's minimum account is 3 months long, costing the equivalent of $9.98 a month (£7.90, AU$13.20), although buying a full year subscription gets you a more average monthly cost of $6.25 (£4.95, AU$8.25). We wondered if the company had something to hide, but actually its policies are clearer than most competitors. There's no logging of origin IPs, connection times, or activities, therefore there's nothing to hand over to anyone. When proXPN does collect personal details, for example during the signup process, they're never shared with anyone else. The terms of service has the standard list of forbidden activities, including hacking, sending spam or distributing viruses. One unusual item forbids "hosting web services... mail, web, DNS, IRC, etc", which might be worth keeping in mind if you use that kind of application. On the plus side, the 30-day ‘risk free trial’ seems to have no awkward bandwidth or other conditions attached. If you're a new user and would like a refund, just email and ask within the first 30 days. ProXPN wants to protect your privacy and anonymity. Really, it does. And yet, it demands a mobile phone number when you sign up, and verifies this by sending a text. When other services can give you an account without even needing your email address, that doesn't look good. The next signup page wasn't much better, offering an extra service to "protect your new RFID-enabled credit cards from hackers and identity thieves". This is a commercial product; we don't expect targeted marketing before we've even signed up. We skipped it and paid via PayPal in the normal way. Our account was created immediately, and we were taken to a web page that offered a Mac client download and iPhone/iPad setup instructions. Neither option worked for our Windows 10 laptop, so we followed the link to the ‘Members Area’. There were no obvious download links there, either, but heading to the support page gave us an installation document with the instructions we needed. After all this hassle, the Windows client was surprisingly capable. We could choose locations and connect from the system tray, or open a more detailed console with choices of protocol (OpenVPN, PPTP, via UDP/TCP), a kill switch to forcibly close programs if your connection drops, startup settings, a world map showing your current location and a handy troubleshooting log. Our performance tests* delivered mixed results. UK-UK connections were speedy at an average 30Mbps download, but switching to a Los Angeles server saw rates plummet to 3Mbps, or even less. By trying other US servers we reached download rates of more like 15Mbps, but that takes some time, and even then it's slower than the leading competition (and under half our non-VPN download speeds). ProXPN's Windows client may appeal to more experienced users, and everyone will appreciate the no logging clause, but that's not enough to compensate for the high price, few locations, poor website, lack of mobile clients and terrible performance on some servers.